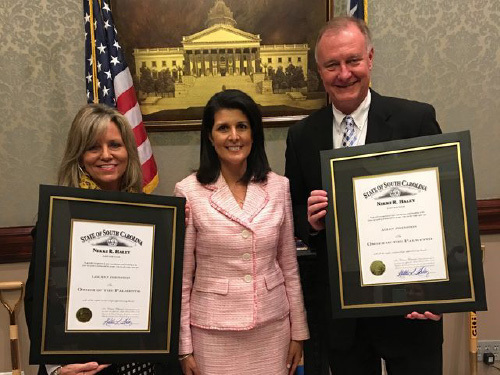 Allen and Lee Ann Johnston, franchise owners of eight Fuddruckers in three states - six of which are in South Carolina - were awarded the South Carolina Order of the Palmetto in recognition to the couple's "extraordinary work and dedication to the citizens of South Carolina” Governor Nikki Haley said in the award letter to the Johnstons. The Johnstons were cited for providing hundreds of jobs in the state; giving countless financial and in-kind contributions to various charity organizations, including Carpenter’s Table food pantry; donating daily proceeds to Mobile Meals; hosting March of Dimes team leader rallies; feeding hundreds by volunteering with the Food Rescue Mission; as well as numerous other acts of community service and awards. In her letter to the Johnstons, Governor Haley said, "It is obvious you have been incredibly effective leaders to those around you. Through your extensive involvement in civic affairs, you have demonstrated a remarkable commitment to bettering the lives of the people of the Palmetto State, and your contributions will have a lasting impact for years to come. In the world of making a positive difference, your passion for service sets a high standard for others, and we are deeply grateful for all you have done." The Order of the Palmetto is a once in a lifetime achievement.